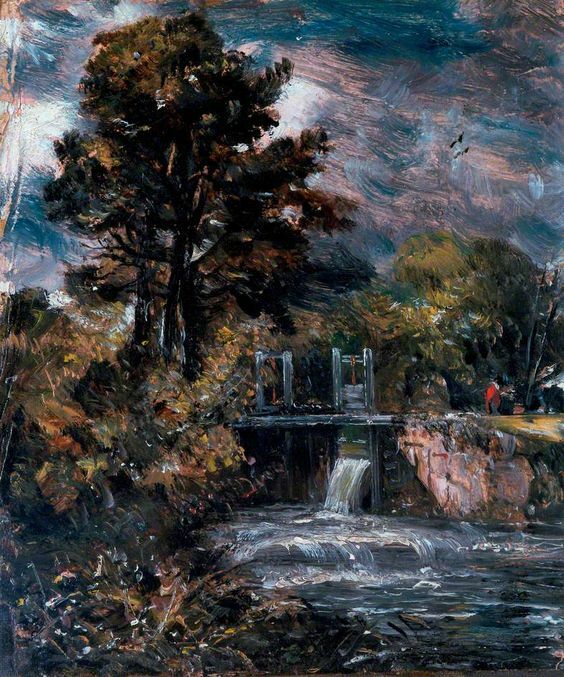 John Constable was born in East Bergholt, a village on the River Stour in Suffolk, to Golding and Ann Constable. 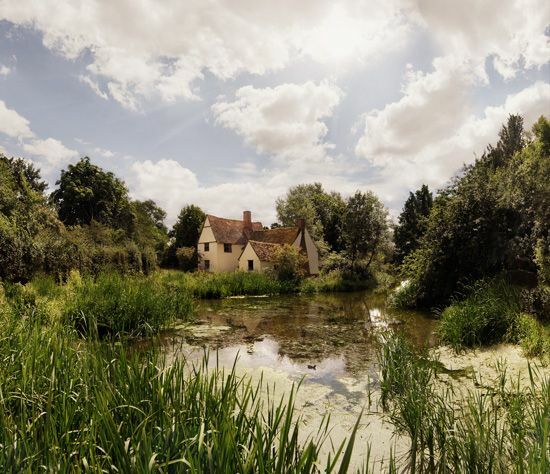 His father was a wealthy corn merchant, owner of Flatford Mill in East Bergholt and, later, Dedham Mill. Golding Constable also owned his own small ship, The Telegraph, which he moored at Mistley on the Stour estuary and used to transport corn to London. 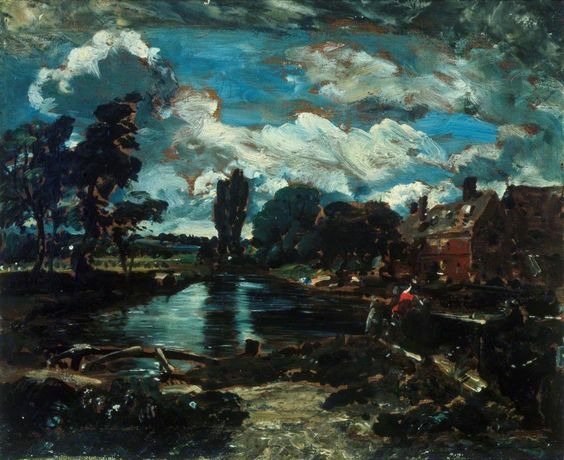 Although Constable was his parents’ second son, his older brother was mentally handicapped and so John was expected to succeed his father in the business, and after a brief period at a boarding school in Lavenham, he was enrolled in a day school in Dedham. 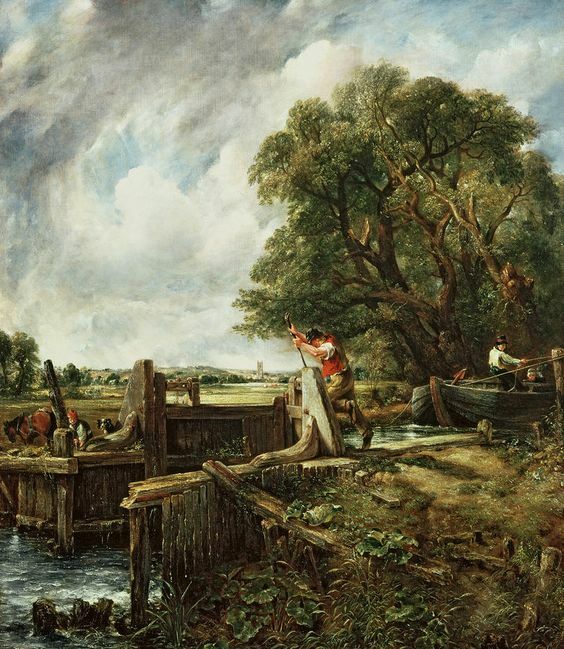 Constable worked in the corn business after leaving school, but his younger brother Abram eventually took over the running of the mills. 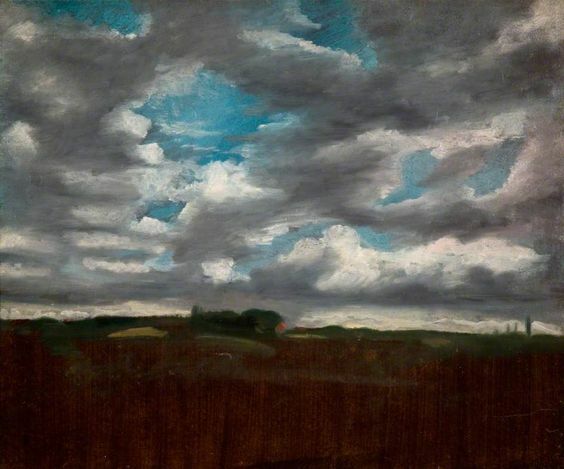 In his youth, Constable embarked on amateur sketching trips in the surrounding Suffolk countryside that was to become the subject of a large proportion of his art. These scenes, in his own words, “made me a painter, and I am grateful”; “the sound of water escaping from mill dams etc., willows, old rotten planks, slimy posts, and brickwork, I love such things.” He was introduced to George Beaumont, a collector, who showed him his prized Hagar and the Angel by Claude Lorrain, which inspired Constable. 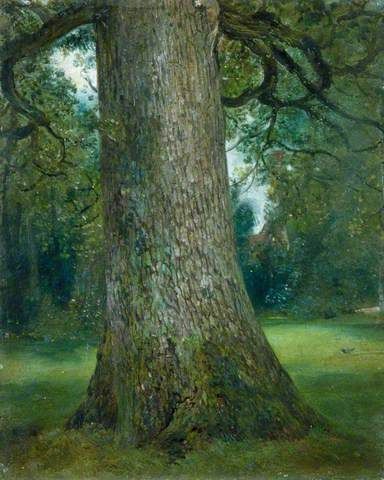 Later, while visiting relatives in Middlesex, he was introduced to the professional artist John Thomas Smith, who advised him on painting but also urged him to remain in his father’s business rather than take up art professionally. His early style has many of the qualities associated with his mature work, including a freshness of light, colour and touch, and reveals the compositional influence of the Old Masters he had studied, notably of Claude Lorrain. 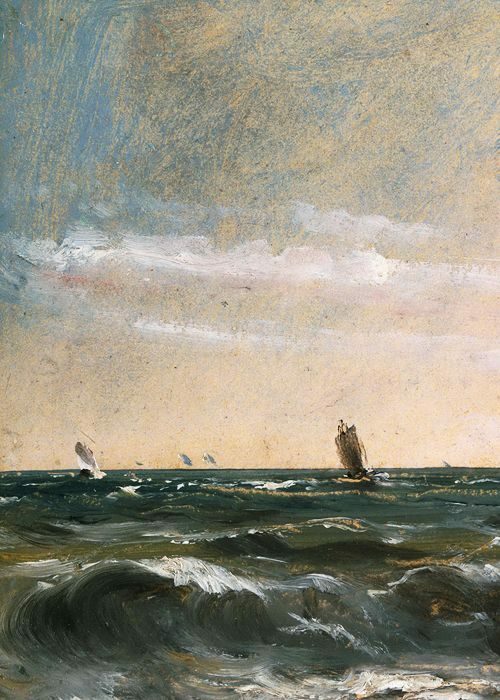 Constable’s usual subjects, scenes of ordinary daily life, were unfashionable in an age that looked for more romantic visions of wild landscapes and ruins. He did, however, make occasional trips further afield. For example, in 1803 he spent almost a month aboard the East Indiaman ship Coutts as it visited south-east coastal ports, and in 1806 he undertook a two-month tour of the Lake District. But he told his friend and biographer Charles Leslie that the solitude of the mountains oppressed his spirits; Leslie went on to write: “His nature was peculiarly social and could not feel satisfied with scenery, however grand in itself, that did not abound in human associations. 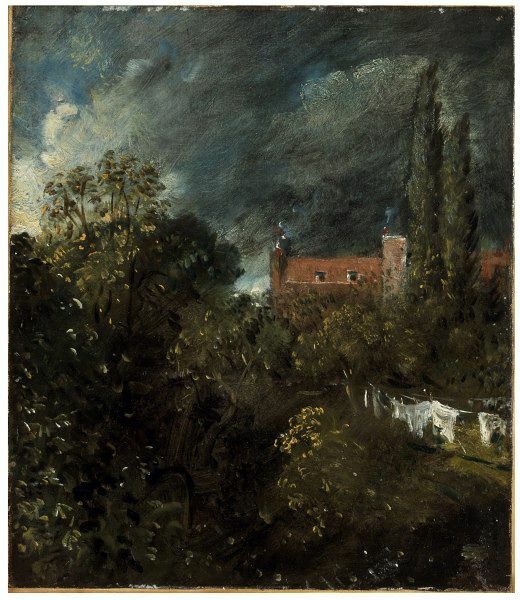 He required villages, churches, farmhouses and cottages.” In order to make ends meet, Constable took up portraiture, which he found dull work-though he executed many fine portraits. 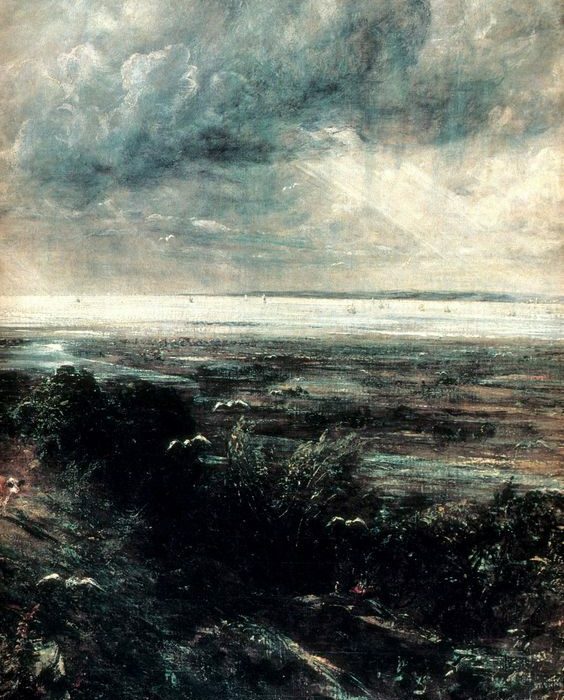 He also painted occasional religious pictures, but according to John Walker, “Constable’s incapacity as a religious painter cannot be overstated.”Constable adopted a routine of spending the winter in London and painting at East Bergholt in the summer. 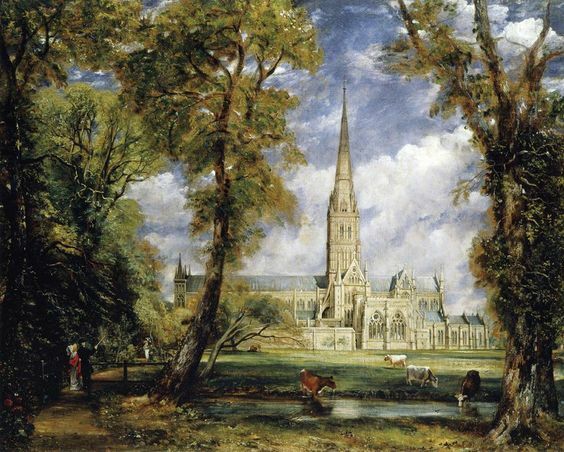 And in 1811 he first visited John Fisher and his family in Salisbury, a city whose cathedral and surrounding landscape were to inspire some of his greatest paintings. From 1809 onwards, his childhood friendship with Maria Bicknell developed into a deep, mutual love. 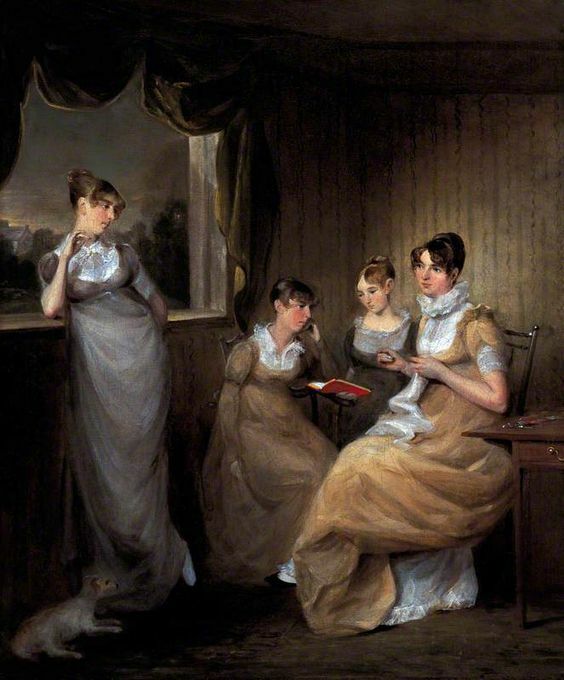 But their engagement in 1816 was opposed by Maria’s grandfather, Dr Rhudde, rector of East Bergholt, who considered the Constables his social inferiors and threatened Maria with disinheritance. 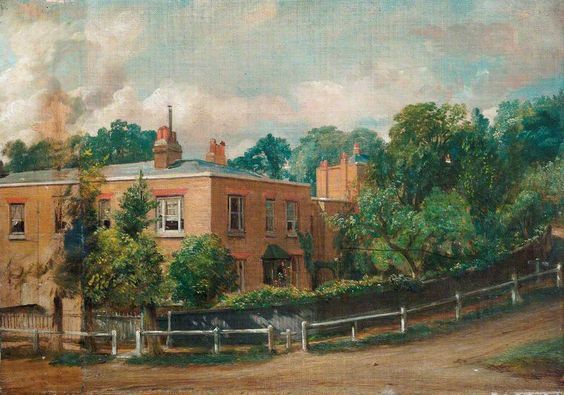 Maria’s father, Charles Bicknell, a solicitor, was reluctant to see Maria throw away this inheritance, and Maria herself pointed out that a penniless marriage would detract from any chances John had of making a career in painting. Golding and Ann Constable, while approving the match, held out no prospect of supporting the marriage until Constable was financially secure; but they died in quick succession, and Constable inherited a fifth share in the family business.John and Maria’s marriage in October 1816 was followed by a honeymoon tour of the south coast, where the sea at Weymouth and Brighton stimulated Constable to develop new techniques of brilliant colour and vivacious brushwork. At the same time, a greater emotional range began to register in his art. 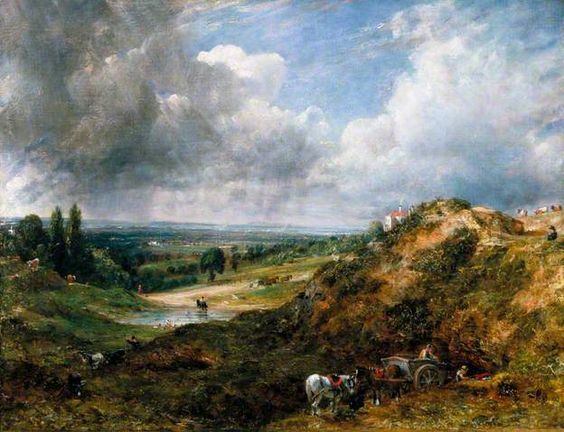 Although he had scraped an income from painting, it was not until 1819 that Constable sold his first important canvas, The White Horse, which led to a series of “six footers”, as he called his large-scale paintings. 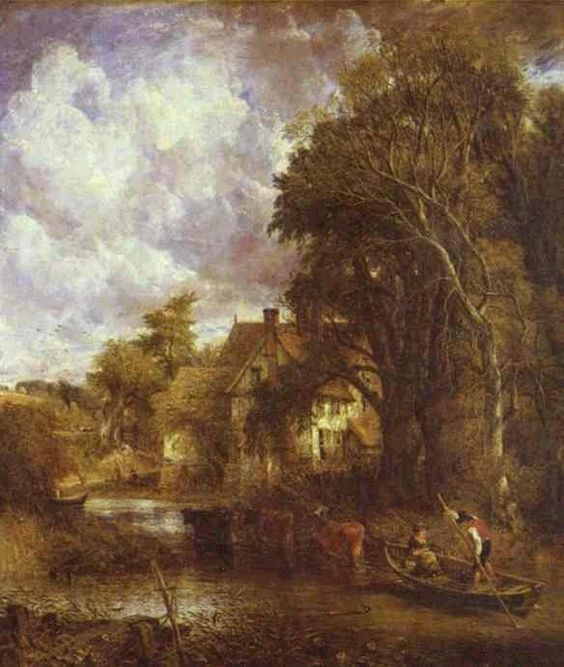 He was elected an Associate of the Royal Academy that year, and in 1821 he showed The Hay Wain (a view from Flatford Mill) at the Academy’s exhibition. 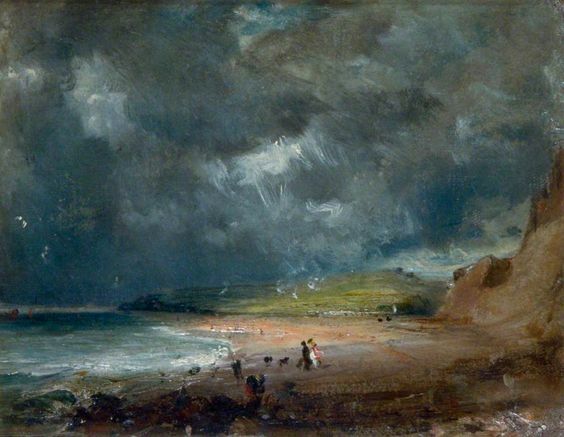 Theodore Gericault saw it on a visit to London and was soon praising Constable in Paris, where a dealer, John Arrowsmith, bought four paintings, including The Hay Wain, which was exhibited at the Paris Salon of 1824, winning a gold medal. 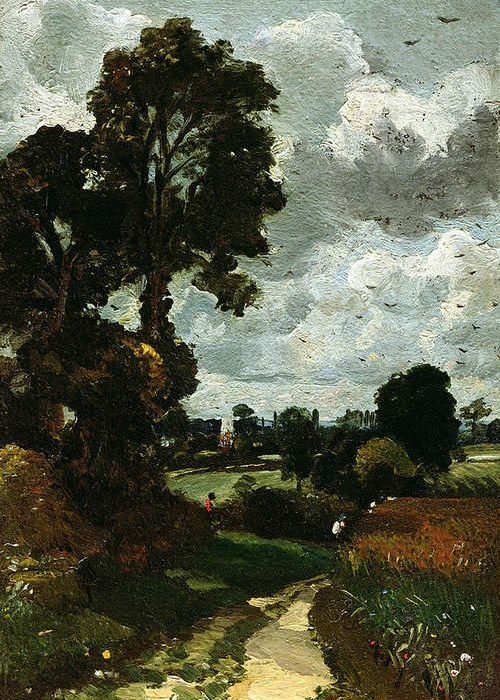 Of Constable’s colour, Delacroix wrote in his journal: “What he says here about the green of his meadows can be applied to every tone”. Delacroix repainted the background of his 1824 Massacre de Scio after seeing the Constables at Arrowsmith’s Gallery, which he said had done him a great deal of good. 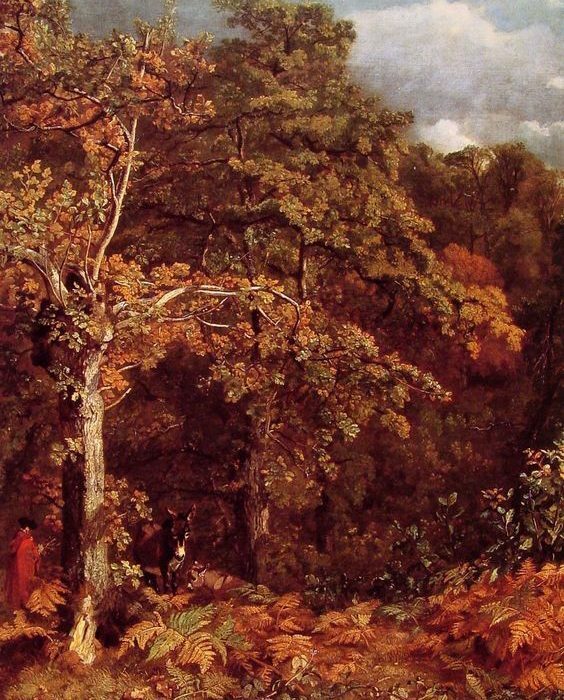 In his lifetime Constable was to sell only twenty paintings in England, but in France he sold more than twenty in just a few years. 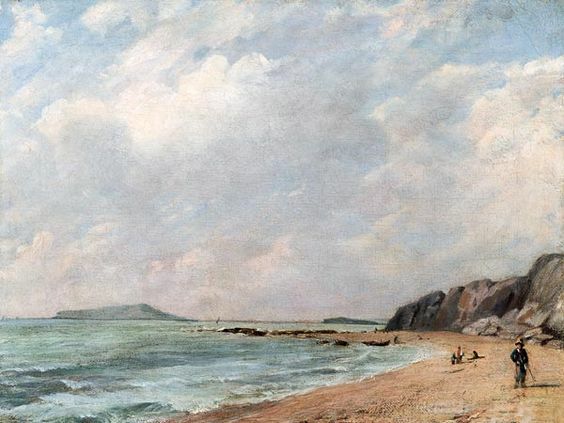 Despite this, he refused all invitations to travel internationally to promote his work, writing to Francis Darby: “I would rather be a poor man [in England] than a rich man abroad.” In 1825, perhaps due partly to the worry of his wife’s ill-health, the uncongeniality of living in Brighton (“Piccadilly by the Seaside”), and the pressure of numerous outstanding commissions, he quarrelled with Arrowsmith and lost his French outlet. After the birth of her seventh child in January 1828, Maria fell ill and died of tuberculosis that November at the age of forty-one. 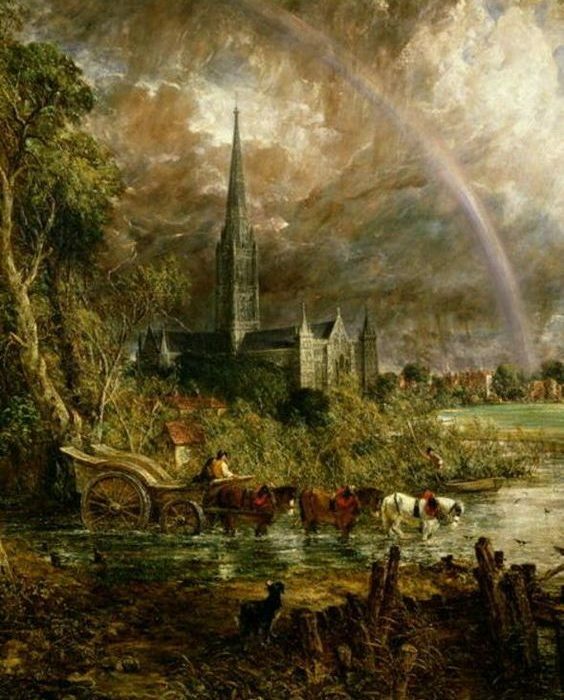 Intensely saddened, Constable wrote to his brother Golding, “hourly do I feel the loss of my departed Angel-God only knows how my children will be brought up… the face of the World is totally changed to me”. Thereafter, he always dressed in black and was, according to Leslie, “a prey to melancholy and anxious thoughts”. He cared for his seven children alone for the rest of his life. Shortly before her death, Maria’s father had died, leaving her pound 20,000. Constable speculated disastrously with this money, paying for the engraving of several mezzotints of some of his landscapes in preparation for a publication. He was hesitant and indecisive, nearly fell out with his engraver, and when the folios were published, could not interest enough subscribers. 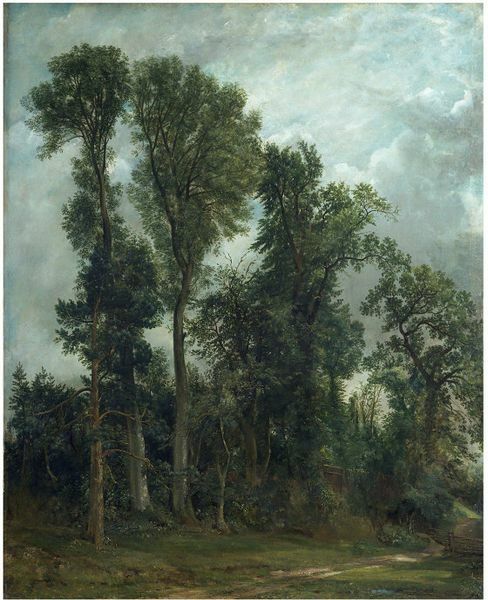 Constable collaborated closely with the talented mezzotinter David Lucas on some 40 prints after his landscapes, one of which went through 13 proof stages, corrected by Constable in pencil and paint. Constable said, “Lucas showed me to the public without my faults”, but the venture was not a financial success. He was elected to the Royal Academy in February 1829, at the age of 52, and in 1831 was appointed Visitor at the Royal Academy, where he seems to have been popular with the students. He also began to deliver public lectures on the history of landscape painting, which were attended by distinguished audiences. 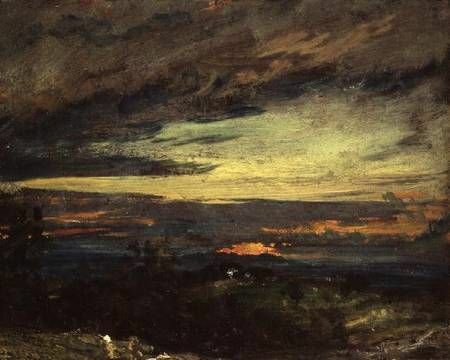 In a series of such lectures at the Royal Institution, Constable proposed a threefold thesis: firstly, landscape painting is scientific as well as poetic; secondly, the imagination cannot alone produce art to bear comparison with reality; and thirdly, no great painter was ever self-taught. He also later spoke against the new Gothic Revival movement, which he considered mere “imitation”.